Easter egg hunts aren’t just for children! Dogs can also enjoy searching for treats. Last year, I took my foster dog Panda to an Easter egg hunt where the dog or his person was required to touch each treat-filled plastic egg with his or her nose. Because Panda wasn’t interested in doing so (Where’s the beef?, he asked), I was down on the ground. 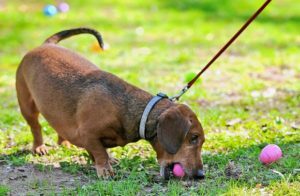 During the Easter egg hunt, each the dog or his person is required to touch each treat-filled plastic egg with his or her nose. Hoping to keep my nose clean this year, I’m heading out to Flag Pole Hill on Saturday, April 20 for the Easter “Bone” Hunt & Doggie Carnival fundraiser for Spay Neuter Network. Come join in the fun! In addition to hunting for homemade dog treats, your clever pup can participate in carnival games like bobbing for tennis balls, doggie limbo and musical mutts. Event festivities include pet sketches, doggy snow cones from Bahama Bucks and snacks for people and their pooches from Nosh Box Eatery. Pet Supermarket, Metro Paws Animal Hospital, Hollywood Feed, Green Pet and other sponsors will provide squeaky toys, frisbees, bandanas, plushies and other giveaways and treats. Proceeds benefit the Spay Neuter Network (SNN), a 501(c)3 that provides low-cost (and often free) spaying, neutering, vaccines, wellness services and microchipping. SNN serves 13 counties and more than 1,300,000 residents in North Texas with emphasis on South Fort Worth, Southern Dallas, and rural communities surrounding the DFW-Metroplex. Focusing on preventing pet overpopulation, SNN works in underserved communities with high rates of unwanted animals. More than 60 percent of their services are offered for free and more than 80 percent include an additional discount on their already low costs. SNN relies on grants and donations to allow them to offset the cost of surgeries, vaccinations and wellness supplies (heartworm tests and prevention, flea prevention). Currently, SNN alters more than 25,000 animals a year at their two stationary clinics (in Crandall and South Dallas) and their Mobile Animal Surgical Hospital (MASH), preventing the birth of hundreds of thousands of unwanted pets each year. In addition to offering free and affordable spay/neuter, vaccination and wellness services for dogs and cats, SNN has a Community Outreach Team that goes door-to-door in high risk neighborhoods, speaks at schools and churches, and sets up booths at local businesses and events to educate pet owners about responsible pet ownership and the free or low-cost services available at SNN. SNN’s Spay it Forward Trap-Neuter-Return (TNR) program helps reduce euthanasia of cats. Thanks to donations from their clinic clients, SNN is able to offer $20 feral cat surgeries at their clinics and via MASH Monday – Thursday. Every cat receives surgery, a rabies vaccine and an ear-tip to identify them as fixed from a distance. Want to support SNN’s programs? Donations of money and/or supplies are greatly appreciated. SNN staff go through 10 rolls of paper towels, three reams of paper, 10 bottles of bleach and two large containers of laundry detergent every day. Donating one of the items on their wish list can save SNN more than $15,000 a year in supplies. You can order these and other supplies directly from their Amazon Wish List. Visit spayneuternet.org/donate/ways-to-give/. There are also plenty of opportunities to volunteer! Saturday, April 20, 11 a.m. – 2 p.m.
Buy your tickets now before they sell out! Visit spayneuternet.org/bonehunt/to purchase tickets. Each ticket admits one dog and two people. Visit facebook.com/events/422916625128439/.